The Vikings made history with the program’s first sectional title in 2017, one year after winning just five games. Freshman Kara Heck emerged to lead the Eastern offense during the 2017 season. 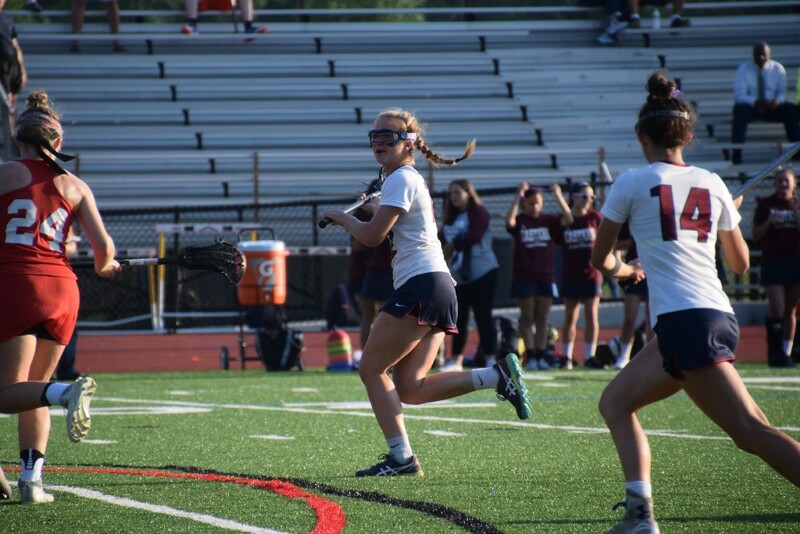 It would be hard to find another high school team that had a better single-season turnaround than Eastern Regional High School girls lacrosse. Last year, Eastern had its worst season in more than a decade, winning just five games and failing to qualify for the playoffs. This year, the Vikings won their first South Jersey Group IV championship in program history, finishing the year 14–6 and advancing to the state championship game. In 2016, Eastern had no seniors on its varsity roster and struggled to win games as a young team. Senior goalkeeper Cooper Cowdin said last year was a learning experience for many of the players. With almost the entire 2016 team returning in 2017, the Vikings entered the season with a lot more confidence. Senior defender Brittany Geis attributes that confidence both to the experienced returning players and a group of freshmen who gave the team a major boost this season. Freshman Kara Heck led Eastern in scoring, while fellow freshman Anacapri Slack became an anchor on defense. Eastern’s defense was much improved from last year. The Vikings held the opposition to 10 goals or fewer in 14 of its 20 games this season, while in 2016, Eastern allowed double digit goals in all but five games. “We were able to hit the longer passes, and I know our communication, while it wasn’t the best, was so much better than last year,” Cowdin said. Despite being much improved, Eastern had its hiccups in Olympic Conference games, especially early in the year. Back-to-back losses midseason against Shawnee High School and Clearview Regional High School had Eastern sitting at 7–5 on May 2. The team wouldn’t lose again for another month. “When we lost to Clearview and Shawnee back-to-back, that was a huge wakeup call,” Geis said. Eastern went on a run, winning seven straight games and making school history in the process. The Vikings defeated Kingsway Regional High School and Clearview in the opening round of the playoffs to advance to the South Jersey Group IV championship against Lenape High School, a team Eastern hadn’t beaten since 2013. “When I walked into the locker room before the game, we were all sitting and thought, ‘we’re not nervous for this game,’” Slack said. “We really wanted that game, more than anything out of my four years here,” senior Jenna Carnival said. After trailing, 6–4, at halftime, Eastern came from behind to tie the game at 11 at the end of regulation. In overtime, senior Kaela Sierra scored the game-winning goal to give the Vikings their first-ever sectional title. Geis said the Vikings learned a lot from their past games against Lenape and did a ton of film study leading up to the win. Eastern went on to beat Central Jersey Group IV champion Rancocas Valley Regional High School in the state semifinals before the Vikings’ season came to a close with a 16–4 loss in the Group IV state championship game against Bridgewater Raritan High School. Head coach Katie Lee talked of the importance of winning a title for the program’s long-term future. She feels the 2017 team’s success will have a positive impact on the team for many years ahead. Geis and the other seniors are thrilled to set a new high for Eastern girls lacrosse. Geis talks of how the team always tried to top the program’s previous best season in 2013, where the team went 18–2, but lost in the South Jersey Group IV championship game. Now, future Eastern players will try to match the accomplishment of the 2017 team. “It’s such a humbling feeling that girls in sixth grade, seventh grade, eighth grade and girls who aren’t even born yet will look at our team as literally setting school records,” Geis said.